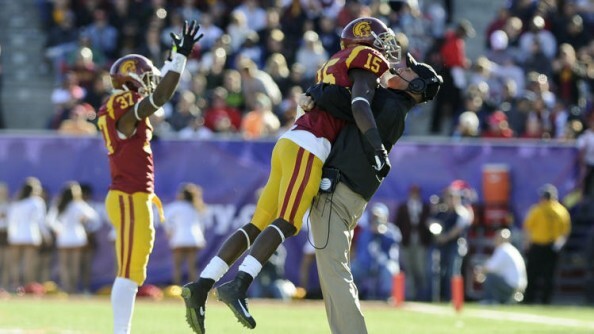 Who would have thought that the 2013 season would end with smiles for USC and even winning 10 games? Cody Kessler put on quite a performance, mostly by targeting Marqise Lee, as the Trojans easily beat Fresno State to win the Las Vegas Bowl 45-20. The Bulldogs, who at one point this year looked like the final BCS Busters, ended the season looking quite outmatched by a good but not spectacular Pac-12 team, with USC playing under its third head coach this year. Clay Helton filled in as the interim, coming in before Steve Sarkisian takes over the team, and coming after Lane Kiffin was fired and Ed Oregron resigned for not getting the job for another season. USC led 35-6 at halftime and after allowing Fresno State, who simply kept on throwing, to get back into the game, put the hammer down with a Javorius Allen late in the fourth quarter to make sure there’s no doubt about who was walking away with the win from Las Vegas. This is a team that hopefully will be remembered forever in USC history. These guys, it doesn’t take a lot to get us motivated. When you’re playing just for someone else next to you, you don’t want to let him down. I can’t say how proud I am of this team. We had to see: Were we going to use it as an excuse to be on our third-string head coach, or were we just going to say, `We’re not going to fail today. After all of the adversity that’s hit us, this win means everything for us. We’ve had four head coaches and were able to get 10 wins. I’ll never forget this team. Kessler, at one point this season, was part of a failing two-quarterback system. Orgeron took charge, and Kessler did well with the change. He had an impressive 22-of-30 for 344 yards, 4 touchdowns and an interception performance, having no problem leaving Derek Carr, the man in charge of the number one passing offense going into this game, out of the spotlight. Carr wasn’t ready for the speed and physicality he was facing, completing only 29 of 54 for 217 yards and a couple of touchdowns. Running game? No one had heard of it at Freson, carrying the ball only six times during the game. Sophomore Javorius Allen had a big day on the ground for the Trojans, scoring two touchdowns and rushing for 87 yards. He finished the season with 786 yards and 14 rushing touchdowns. Marqise Lee, probably playing for the final time as a USC player, had a happy ending to his college career, catching two touchdown passes out of his 7 receptions for 118 yards. He missed three games this season and struggled early on due to the quarterback problems, finishing the year with less than half the yards he had a year ago, stopped at 791 yards and only 4 touchdowns. 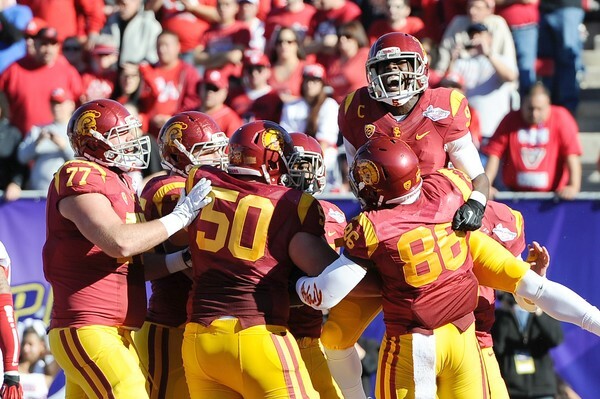 The Las Vegas Bowl is never something USC aspire to reach or win, but you take what you get. After last year’s collapse and embarrassing bowl game performance, this year feels like taking a step in the right direction, and hoping that Sarkisian was the right man for the job to continue and pick up the pieces.